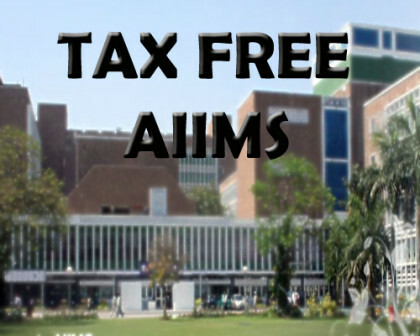 The finance ministry has declared fund donation to the All India Institute of Medical Sciences (AIIMS) as tax-free to encourage more donors in the country for the apex health institution, a statement said on Monday. This was followed after Finance Minister Shri Arun Jaitley announced recognition of AIIMS as an Institute of National Eminence and 100% tax exemption for any voluntary donation made to AIIMS while addressing the 43rd Convocation of AIIMS. Accordingly to the ministry of finance, those who donate fund to AIIMS will now get 100 percent income tax deduction of donated amount from their taxable income. The decision was taken after AIIMS was notified as the institute of national eminence by income tax authority, under Department of Revenue under the Ministry of Finance. AIIMS was recently given a notification certificate by the income tax department. The institution in a statement said that the notification would not only help to attract more philanthropic funds for the patient care services in the institute but also promote this national institute of excellence in the area of medical education and research in the country with having such a financial support from the philanthropic funds.